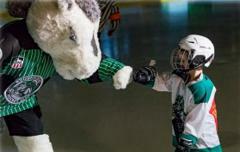 During the Hockey Season, there will be plenty of fun opportunities for youth hockey players to be a part of. As we have opportunities available, we'll be listing them below, so please check back. Are you a Mini-Mite, Mite or Squirt parent? 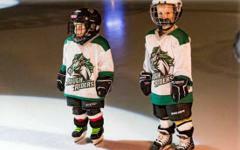 Would your Mite or Squirt like to skate out and be introduced at RoughRider Games? Sign up HERE to be a "Little Saver of the Game"! You'll need to head to the WELLS FARGO BANK on 33rd and 6th on the SW side to pick up their free JERSEY before the game, then enjoy a free ticket for you and a reduced ticket price for you and all members of your group that night! PLEASE have your players here 20 minutes prior to the game. They can get dressed in OLY locker room #4, which will be locked for the remainder of the game so you can leave their gear in there once the game begins. Are you a PeeWee or Bantam parent? 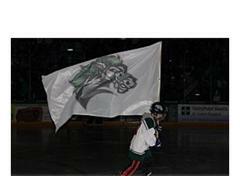 Would your player like to skate out carrying the RoughRider flag to lead the team into battle? Sign up HERE to be a "Flag Waver"!